One of the best all natural, biodegradable and effective wash products on the market today, we offer these products to you for all your washable products! You can wash your woolens, silks and all delicate fabrics with confidence! EUCALAN Wool wash. A no rinse fine fabric wash that conditions fibers while protecting against moths. Ideal for hand washing or machine wash with a wonderful fresh scent. No rinsing provides for less stress on fibers and Eucalan is a environmentally friendly; dust mite deterrent and anti-static. Available in a variety of sizes and scents. Eucalyptus – Eucalan’s Eucalyptus is the original scent. First introduced in 1989, it is scented using essential oil of eucalyptus. Eucalyptus oil is a natural moth and flea inhibitor, so use regularly on woolens and particularly before storing them for the season. The lanolin enriched formula helps to naturally condition fibers and keep static away. Use on all your delicates like sweaters, lingerie, hosiery, comforters, down jackets, bathing suits and baby items. An excellent choice for men. Grapefruit – Eucalan’s Grapefruit is scented using essential oil of grapefruit. Grapefruit oil is a natural antiseptic which is particularly nice when washing garments that lie close to the skin like hosiery, workout wear, bathing suits and lingerie. The lanolin enriched formula helps to naturally condition fibers and keep static away. Use on all your delicates and enjoy the fresh light scent. Lavender – Eucalan’s Lavender is scented using essential oil of lavender. Known for its natural moth and flea inhibiting and antiseptic properties, this is a great wash for all of your fibers. The lanolin enriched formula helps to naturally condition fibers and keep static away. Lavender’s soothing spa-like scent has been described as an aromatherapy treat for the user and is ideal for baby items like blankets, stuffed animals, clothing and wool diaper covers. Our most versatile scent, use it on all your delicates like sweaters, lingerie, hosiery, comforters, down jackets, bathing suits. 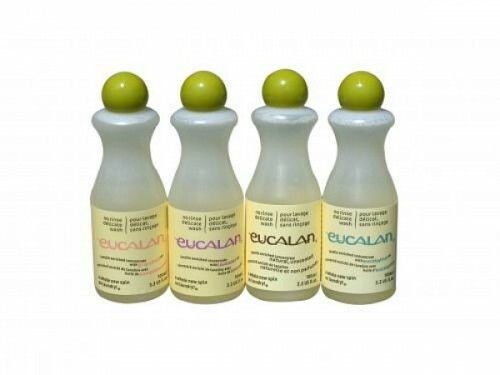 Natural – Eucalan’s Natural is the same great formula, but no scent has been added to it. The lanolin enriched formula helps to condition fibers and keep static away. 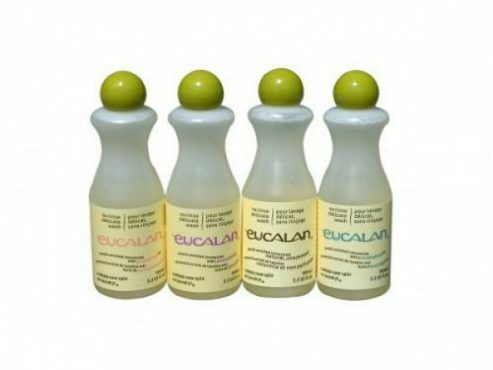 For those scent sensitive people, use Eucalan Natural on all your delicates like sweaters, lingerie, and hosiery, comforters, down jackets, bathing suits and baby items. Wrapture – Eucalan’s latest addition is Wrapture by designer Kristin Omdahl, infused with the beneficial essential oil of Night Bloom Jasmine. Jasmine oil is a natural antiseptic making it perfectly suited for your most delicate fibers. Like all Eucalan scents, Wrapture contains a touch of lanolin to naturally condition fibers and keep static to a minimum. Wrap your delicates in the romantic and intoxicating scent of Jasmine.